Facilities: FCI Hazelton with a Secure Female Facility. 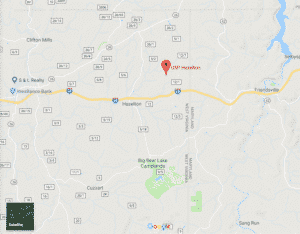 Location: FCI Hazelton is located in the mountains of Preston County, West Virginia, in the community of Bruceton Mills, approximately 35 minutes from Morgantown; 45 minutes from Uniontown, PA; and 45 minutes from Cumberland, MD. Background: FCI Hazelton is a medium-security United States federal prison for male inmates, as well as a secure facility for female inmates, located in Preston County, West Virginia. It opened in 2015. FCI Hazelton is part of the Hazelton Federal Correctional Complex (FCC). Housing: Inmates are housed in cells and dormitories. Health Services: Health services at FCI Hazelton and the Secure Female Facility facilities include episodic visits for new or recurring medical or dental symptoms through a sick call system, chronic care management for chronic and infectious diseases through enrollment in chronic care clinics for regular care, routine dental care, medical and dental emergency care for injuries and sudden illness, age-appropriate preventive care to promote optimal health and functional status, restorative care to promote achievable functional status, long-term care, and end-of-life care. Psychology Services: Inmates at FCI Hazelton receive mental health screening, assessment, and treatment, individual and group counseling, psycho-educational classes, self- help and supportive services, and referral to Health Services for medical treatment of a mental illness. The female facility also offers the Resolve Program, a non-residential program for female inmates who have a history of physical and/or sexual abuse. Residential Drug Abuse Program (RDAP): A Residential Drug Abuse Program (RDAP) is available at FCI Hazelton but not at the Secure Female Facility. Alcoholics Anonymous (AA), Narcotics Anonymous (NA), the Non-Residential Drug Abuse Treatment Program (NR-DAP), and the Drug Education Class are available at both facilities. Education Services: FCI Hazelton and the Secure Female Facility provide GED and English-as-a-Second Language (ESL) programs. Incentive awards are provided to recognize inmates making satisfactory progress and successfully completing the literacy (i.e. GED and ESL) program. Inmates may also receive incentives for progressing to various levels in the GED or ESL programs. Graduation ceremonies recognize GED, ESL, and Apprenticeship completions. FCI Hazelton and the female facility offer parenting, Adult Continuing Education (ACE) and career counseling/Pre-Release Program (RPP) courses, and Microsoft Office 2010. High school diplomas and post-secondary programs are available through paid correspondence programs. Advanced Occupational Education: FCI Hazelton and the Secure Female Facility do not offer any advanced occupational education programs. Vocational Training: No vocational training is offered at FCI Hazelton or the female facility aside from the education services and apprenticeship programs. Apprenticeship: The FCI Hazelton Secure Female Facility offers apprenticeships in Electrician, HVAC, Maintenance Repairer Industrial, Plumber, and Welder. Library Services: The law library is located in the Education Department and contains a variety of legal reference materials for use in preparing legal papers. The Education Department maintains a leisure library which is available to the general population. Reference books such as, encyclopedias, dictionaries, medical encyclopedias, college listings and synopsis, recent volumes of “Books in Print,” etc. are available. These reference books are available for use within the Resource Library. Magazines, books, and newspapers are also available to inmates at FCI Hazelton. UNICOR: FCI Hazelton does not house a UNICOR facility. Commissary: Inmates may withdraw money for family support, to purchase publications or for other approved purposes. Inmates are permitted to spend up to $360.00 each month, which does not include stamps or funds transferred from commissary to their inmate telephone account. Shoes, clothing, electronics, food, drinks, and more can be purchased in the commissary. Recreation Services: FCI Hazelton and the Secure Female Facility offer physical fitness and leisure programs, including organized and informal games, sports, physical fitness, table games, hobby crafts, music programs, intramural activities, social and cultural organizations. Movies, artwork (e.g., oils, pastels, crayons, pencils, inks, and charcoal), and hobby craft activities (e.g., ceramics, leatherwork, models, clay, mosaics, crochet, knitting, sculptures, woodworking, and lapidary, etc.) are also available. Wellness programs and recreation are also provided.